The NFL is quickly becoming a league of up and coming quarterbacks, and there is one who is already in the MVP conversation. Patrick Mahomes II stepped into the Kansas City Chiefs starting QB role and doesn't look like he'll leave for a while. 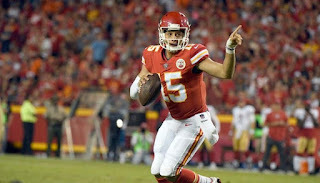 The Chiefs are 3-0, and this week Mahomes II made a statement against the San Francisco 49ers. A flawless performance of 24-38, with 3 TD, 314 yards and 0 INT. In fact, no INT for the year with 13 TDs. The Chiefs have already won two road games in the AFC and look like the potential class of the AFC. Mahomes II was the 10th overall pick in 2017 while the front office game him a year to acclimate, it looks like it's paid off. Is he the Chiefs QB to take them to their first Super Bowl since Super Bowl IV? A proud franchise hopes so. Mahomes II is the Longhorndave Sportsman of the Week!